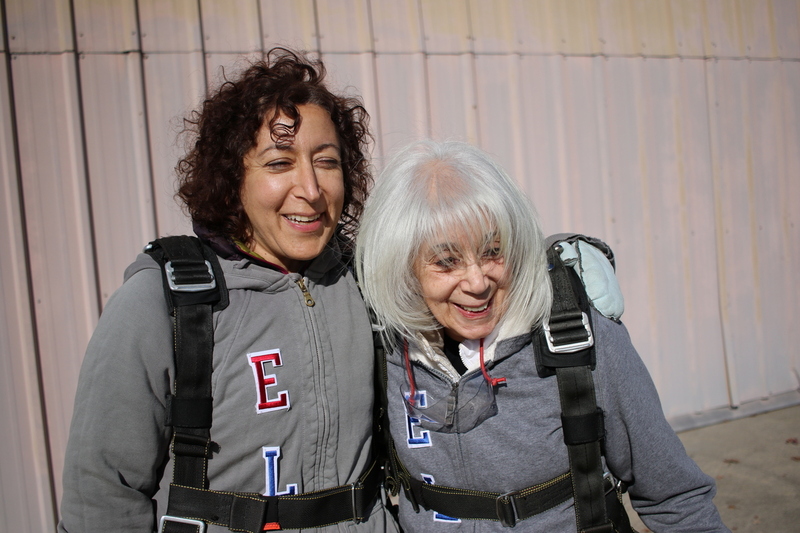 A Grieving Woman And Her Daughter Try Skydiving To Shake Grief : Shots - Health News The first episode of this season's Invisibilia podcast explores how people cope when something happens that fundamentally shifts how they view themselves. The author's mother decided to try skydiving. There are lots of times when moms ask us to do things we don't want to do. Move the car. Wipe down the table. Get a haircut. Call the great aunt on her birthday. Figure out why my new phone is making a weird buzzy sound and why can't I get into my Facebook account and, you get the picture. My mom? Last fall she asked me to jump out of an airplane. Now, I am generally not a person hindered by fear. As a child I was the one chosen by cousins to play the monster under the bed because I could happily hide in the dark by myself for hours. But lately I have developed just one single deep, visceral, nausea-inducing fear. And just my luck, it's a fear of heights. I noticed it one afternoon when I took my son and his friend to visit the Sears Tower in Chicago and walked out onto the glass balcony. Looking down at the city under my feet, I got so dizzy that I stumbled backwards and knocked over a small child behind me. Intellectually, I recognized that this newfound phobia was probably some glitch of biology. My doctor blamed it on my balance getting worse with age. One theory is that your vertical perception deteriorates, and you get worse at approximating distances. It might just be that having children makes you less of a daredevil. Whatever it is, the fear was making it hard for me to be a dutiful daughter. "If you're so afraid, then why are you doing it?" all my friends asked, which was the obvious, reasonable question. But I didn't feel that I had a choice. 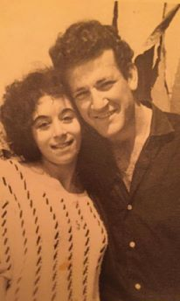 A year earlier, my mother's husband — my father — died quickly and unexpectedly of a rare form of cancer. They'd been married for 51 years. They had done everything together. He drove her to the subway every morning, picked her up in the evening, made her tea every night. After he died she was in a permanent state of shock. All her bossiness, humor, vitality — gone. Then on the first anniversary of his death she sent me a text. It was a link to a place called Skydive Cross Keys outside Philadelphia, with a photo of a guy doing two thumbs up as he tumbled out of a plane. My mom is 74, and not at all physically adventurous, or any kind of adventurous. She's never even ridden a bike. The fact that she wanted to jump out of an airplane meant that some revolution was brewing inside her. She'd gotten it in her head that skydiving was the one thing that would help her move forward. Her logic has to do with my father having been a paratrooper in the Israeli Army and also one other thing: "Up there we will say 'hello' and meet someday," is what she texted me. Up there, she would catch a glimpse of her husband. Deliver a message. Then separate, but vow to meet again soon. It was a little alarming and death-wishy but you'd have to have a heart of coal not to sign on. Hanna and her mother Miriam Rosin wore the letters E-L-I on their sweatshirts in honor of Hanna's father Eli Rosin. "Can't you just wait for her on the ground?" my friends asked. But that seemed like cheating. Who would send a 74-year old woman into the barren sky, alone? Plus, if she could make such a sudden radical shift, couldn't I? I've watched a few episodes of the View. If a woman my age has fear, her only option is "conquer." If two women — and especially a mother and daughter — go on a road trip, their only option is to "push beyond their limits" and "awaken something within." Determined, I put my trust in Google, hoping to find some celestial inspiration. This was an amateur Internet error. "Skydiver dies in parachute malfunction." "Three skydivers die after mid-air collision." "How I Survived a Skydiving Accident." Tabloids and YouTube love them a skydiving accident. That last one involved a tandem skydive in which the instructor's parachute and then emergency parachute failed to open, because it was too busy strangling him unconscious. I had made zero progress when, on the morning of our jump, my mother picked me up at the Philadelphia train station. She drove us out to the open field and I sat next to her, recording the trip with my microphone — both to steady my hands and take my mind off visions of accidental strangling. As the sky grew increasingly gray and the wind picked up, I tried to hide my relief. I had done enough Googling to know that no respectable outfit will let you skydive when the weather turns south. We arrived and the receptionist's face made it clear: We were not going to skydive that day. My mother begged, and I went to the bathroom to secretly high five myself. My mother, however, is the most stubborn person on Earth, so a week later we were road-tripping again. And this time, clear skies. Here is where I wish I could bring in the rousing music to indicate inner limits dissolving in open air. Unfortunately, I am too much of a realist. "Skydiving" is such a majestic term, a centuries old dream of being freer than free that dates back to Leonardo DaVinci's first sketch of a parachute. But to me, it is what it is. You fly 12,000 feet up in a rickety airplane, and then walk out the door. My mom took two old sweatshirts and sewed the letters E-L-I onto them for us. That was my father's name. Eli. In Hebrew it suggests ascending to God, something up high. I sat in the back of the tiny plane as we climbed up high, trying not to look out the window and track how very far up we were going. The skydiving video guy tried to get me to say I was excited, but in the video I just nod my head no and stare grimly ahead. First a young guy ahead of us tumbled out the door. My mom was next. She took her position at the edge of the open door, and the instructor adjusted her arms and chin. I watched with growing terror as a stranger pushed my mother out an airplane door and then it was my turn. Hanna prepares to jump from the plane. Psychologist Jerome Kagan has done many studies on fear and the anxious mind. 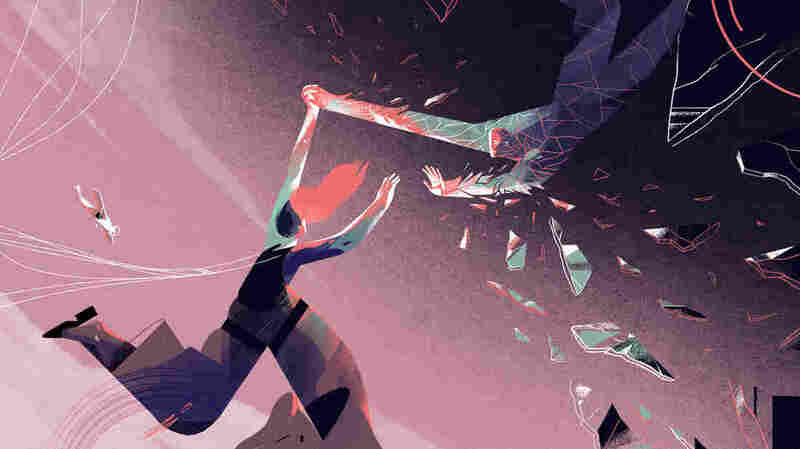 His theory is that we are all born with a certain temperament — either more or less fearful — and while we can work mightily and successfully against our natural instincts, we can never fully overcome them. He calls it "the shadow of temperament." The conclusion has always struck me as gentle and generous towards the fearful, because it allows them to brave unknown territory while still holding onto their essential selves. But what about the naturally fearless, like me? Nobody talks much about what happens when they stray into the unfamiliar territory of deep fear. I jumped. I don't know how it happened but it did. The instructor I was attached to just moved me to the door and I was out. I remember that it was freezing, and my ears hurt a lot. I remember he asked me, "Are you OK?" because I imagine most people, at some point during the jump, marvel at the beauty below. I can't say I ever did relax and enjoy the view. I just kept thinking, "DOWNDOWNDOWN" until we were down. In the standard video they ask everyone if they would do it again. My mom answered an ecstatic "Yes" before he got the question out. My answer was "#$@%* No!" and then I think I mumbled, "Why do humans do this to themselves?" The author skydives over Pennsylvania. In the end, I did not get over my particular fear or push beyond my limits or awaken anything within except a terrifying jolt that hits every time I step onto an airplane. It's a very unfamiliar feeling for me, but maybe I can adopt a bit of Kagan's generosity in this situation and accept that I will experience this one little pocket of terror without betraying who I am. At the very least, it made my mom happy. Because after a long, crushing year, she got to be the brave one.